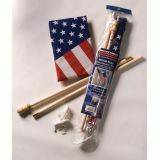 Our US Home Flag Kits make an elegant way to show your patriotic pride during national patriotic events and celebrations. 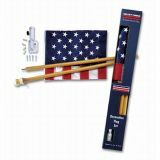 Our US flag kits are 100% made in USA and come with everything you need to ensure a spectacular flag display including stamped steel bracket, gold plastic eagle, 2 connector rings, and a printed polycotton U.S. flag with grommets. 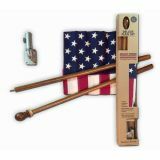 Our US Home Flag Kits make great gifts for new homeowners, for birthdays, Father's Day, Veteran's Day, and more! Shop from our complete line of U.S. Home Flag Sets right away and find our great prices, quick shipping, and much more! 100% customer satisfaction guaranteed! Need a beautiful and complete American flag set for your home or as a gift? Look no further than Tuff Flags as we have US home flag sets in all possible models for every budget. 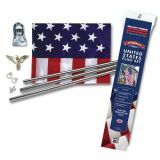 These flag sets feature premium quality American flags, poles and durable hardware. These ready to use U.S. Home Flag Sets make great gifts during patriotic holidays or other national events and can be mounted easily. Our U.S. Home Flag Sets are available in various popular sizes including 2.5’ x 3', 2.5' x4’ and 3’ x 5’ among others. Be it the Wooden Pole Economy Flag Sets or the Cottage U.S. Home Flag Sets that are well suited for daily use or the U.S. Hospitality Flag Sets that feature a mahogany pole and pineapple ornament that create a warm and welcoming feel, we have a lot of models to choose from. Browse our collection of U.S. Home Flag Sets and choose a flag that matches your need. Should you need any assistance, just call us at our toll free number (888) 287-3524 or email us at customercare@tuffflags.com.